T-shirt dresses are very easy to make. You need a t-shirt and two rectangles of non-stretch fabric; one for the front and one for the back. Cut the t-shirt to the desired length. Attach the gathered skirt to the t-shirt. You can, of course, make lots of variations to the basic dress. 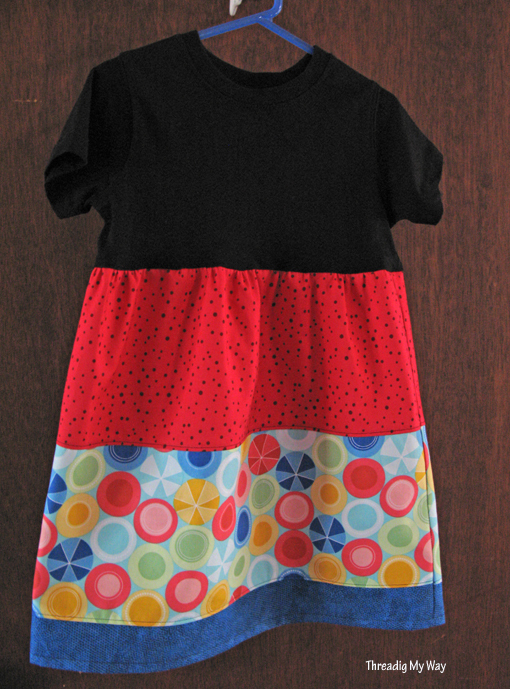 For the t-shirt dress above, I've used the Cupcake Dress pattern, from the book Make It Perfect, by Toni Coward. It's a great little pattern, with step by step instructions and most importantly for me, gives the measurements for sizes 0 - 5. This is the second time I've used this pattern. Here's a link to the first Cupcake Dress I made last year soon after I began blogging. I like the ratio of fabric sizes used in the pattern, but you could mix and match with any number of fabrics. I've used fabric from my stash and a t-shirt I bought on sale quite some time ago. 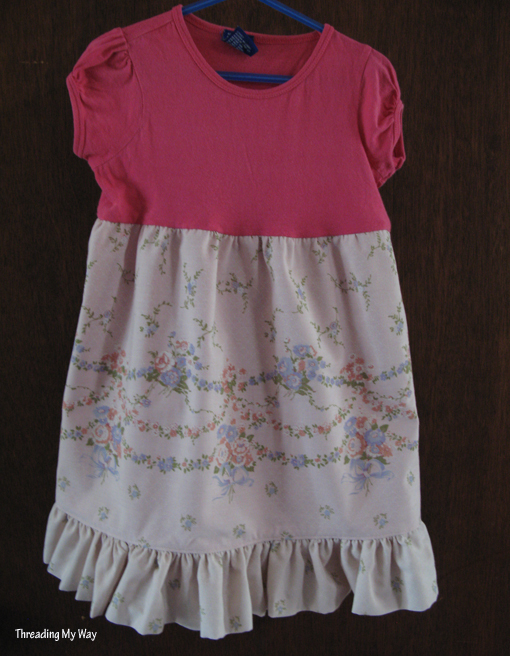 The pink t-shirt dress is made from a pre- loved, but still in good condition, t-shirt. The floral fabric is left over from a quilt my Mum made many years ago. Even though the floral pink is unused, it was just a tad see through when held up to the light, so I've lined it with a pink quilting cotton. To finish the dress off, I've added a ruffle. Ruffles are a good way to make a dress pretty. There's various ways of doing ruffles, but I sew two rows of basting where I want the gathers. Basting is long stitches that are later removed. They can be machine or hand sewn, but in this case I set my machine to the longest straight stitch to baste. Sew the two rows of stitching about 1/8" apart. Don't backstitch and leave the threads hanging. Machine sew the ruffle to the dress by sewing in between the two basting rows. This is an overview of making a ruffle. Next time I make one, I'll try to remember to take photos. I'm quite happy with how I do my gathering, but I'm curious about gathering and ruffling feet for my machine. If they produce the desired results and save time, I'll invest the money and buy one or both. I'm unsure how they produce gathering that is the exact length you want it to be. By hand gathering, I have complete control over the gathers. Can you do this with a gathering or a ruffling foot? I'd love to hear from anyone who uses these attachments. I started a third t-shirt dress, but unfortunately didn't finish. The t-shirt was smaller than the two above and when sewing, I caught some of the t-shirt, that I shouldn't have, in the seam to join it to the dress. No problem I thought. Just unpick it and start again. Not so!!! I hadn't bothered with a ball point needle just for sewing one seam, when one half was non-stretch anyway. Consequently, there were little and some not so little, holes where the needle had cut the fabric. There were too many holes to hide with an embellishment such as a fabric flower and the t-shirt will be too short if I cut the holes off. Lesson learned: use a ball point needle for sewing with stretch fabric! These two dresses will be heading off to the Australian representative for Dress A Girl Around the World. 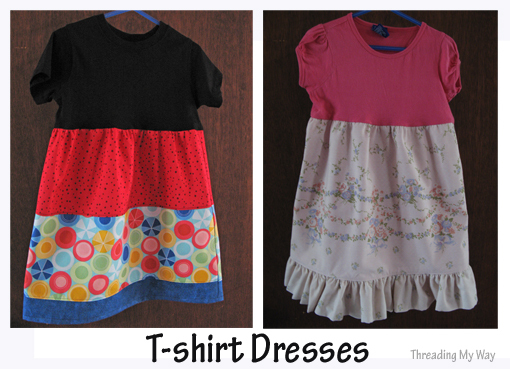 I've found (but not used) some free tutorials on making t-shirt dresses. The tutorials all have step by step instructions with lots of photos. Have a look at the tea towel dress that Sherry, from What I Made Today, has sewn for Dress A Girl Around the World. Yes, it's made from five tea towels and it is simply lovely. If you would like to find out more about Kristy's sew-along to support Dress A Girl Around the World head on over to Hopeful Threads. These dresses are just darling! Thanks for the link back to my post Pam. I sent off the dress today. It's a really great feeling you get from being involved in a cause like this one. You will have made a little girl somewhere a little happier, Sherry!!! These dresses are so cute! :) I'm going to try to make some from tank tops this summer! Thanks for sharing!! Another option for my foray into dressmaking. :) These are very sweet, Pam. Love the idea and am very pleased with the dresses. I am also keen to know more about a ruffling foot. I have been reading See Kate Sew's Ruffle 2012 event with interest. Some beautiful projects! Adorable dresses! I been sewing alot of clothes for my 2 yr old grand daughter and will have to add this one as well! thank you! I love easy projects, but easy projects that are also super cute are even better! Love them. Oh, Boy! You have sewn so many cute dresses for a good cause! More gorgeous dresses Pam - you're doing an amazing job making all these - and they will be very much appreciated! Lovely! I especially like the ruffle at the bottom - so cute! These are cute and simple too Pam! When I made one a couple of years ago when I first started the blog it was a disaster! You have inspired me to give it another go! So cute. I love that you used "pre-loved" t-shirts for the tops. I am impressed at how many dresses you have made for this cause. Great Job! Very cute Pam! Thanks so much for the inspiration, maybe I'll get up the nerve to start sewing, hopefully soon! Thanks so much for sharing on Craft SchoolingSunday!